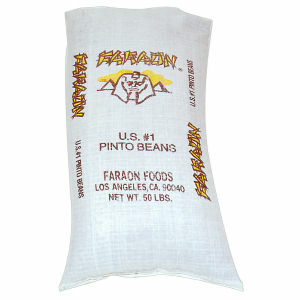 Faraon pinto beans are not only delicious, but also an excellent part of a healthy meal! Our fifty pound bag is perfect for restaurants, large families or special events! Well known for its nutrition, protein, and fiber, Faraon is a perfect compliment to any dish. No cholesterol or fat. All Faraon® quality beans are carefully selected and packed using a special process to ensure your satisfaction. No wonder they say "Que Ricos Son!®", how delicious they are!